India doesn’t have a Christmas tradition, but times are changing. Now more than ever Christmas is being widely celebrated with house parties, dinners and Secret Santas. 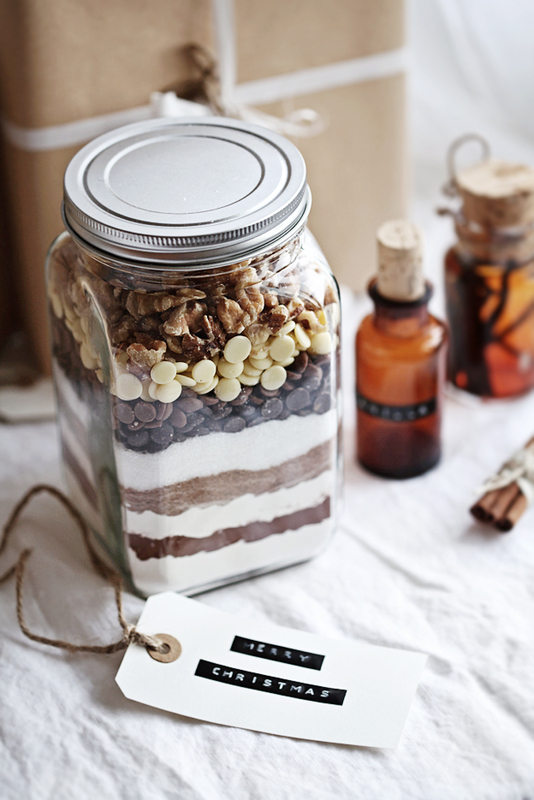 Whether you partake in a gift exchange or just want ideas for gifts you could use for birthdays later on, consider this a roundup of the easiest gifts you make for your friends and family. Bonus when they remember your thoughtful gift and try to return the favour. Little to no skills/creativity required. Every well dressed girl’s nightmare is to wear something someone else is. Why not gift her a pair of shoes wonderfully unique? This is the easiest upgrade for a normal pair of shoes. Try it on this pair of shoes from Jabong, or any T-strap variant. Tutorial here. If your friend is a person who loves upgrading her room with unique items, give her these lovely decorations. It’s so easy- all you need to do is dip yarn in watered down glue, wrap around balloons and let the air out of the balloons when dry. Bonus- they make a great photo backdrop. Details here. If she likes to mess around in the kitchen and eat great food, gift her a brownie mix in a jar. It manages to look great & serve the great purpose of making brownies. Directions here. If she doesn’t use eggs, no problem! Use the dry ingredients from an egg-less brownie recipe of your choice, but be sure to give updated instructions for baking. 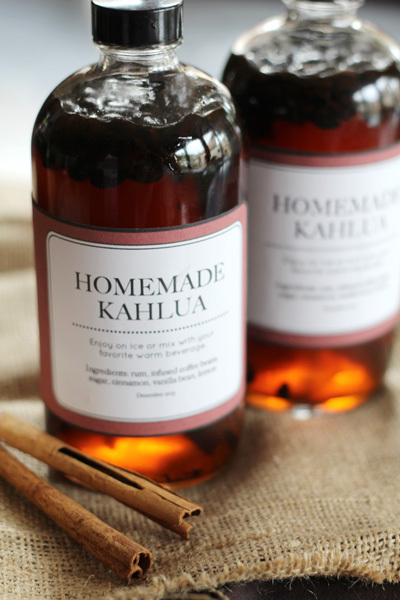 Gift her/him a bottle of homemade kahlua- a sweet coffee & cinnamon liqueur that can be used in desserts and drinks. This takes a few weeks to infuse but will be a thoughtful gift he/she will actually use. You need alcohol for the version pictured, but try this for a non-alcoholic alternative and add cinnamon and orange like in the alcoholic recipe for a closer match. 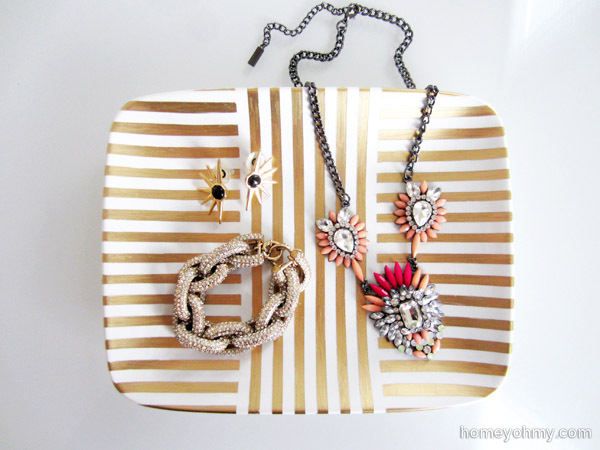 The one who has too much jewelry: Picture from Homey Oh My! Okay so I lied a little. 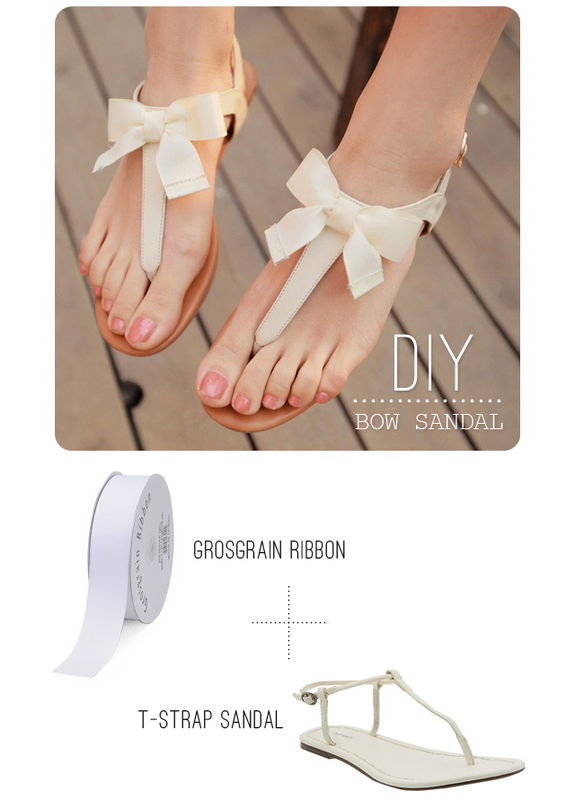 This DIY is if you’ve got a little patience. It’s a gorgeous way for your friend to keep her necklaces, rings and what not. If you can’t manage a pattern with tape, polka dots would work in a pinch (& it will probably save you ink too). You get the plate probably anywhere, the gold markers at StarMark in Express Avenue, and the acrylic spray at Hindustan, but you could substitute it with Fevicol. Full tutorial here. Every guy loves food. Every person in a dorm misses comforting food. Both the categories also like food that’s fuss free and easy to eat. 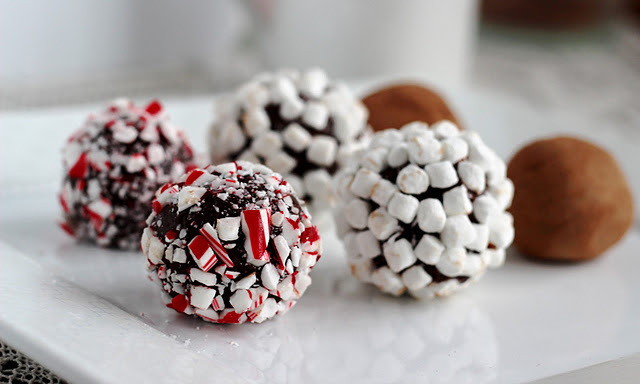 These hot chocolate truffles are easy to make (heavy cream = Milky Mist medium fat cream) and you can make your own variants (add cinnamon and nutmeg for Mexican hot chocolate). Drop in a mug of warm milk and it’s done. Directions here. All these gifts would work even if you swapped them around. Plus, they aren’t specific to the season and they also aren’t the kind of crafts you can only make if you live somewhere that isn’t Chennai. Stay tuned for a guide to the best gifts that you can buy (regardless of what gender the gift giver and recipient are).